Item Number: 310-12-30 15984 Actual Weight: 14 lbs. 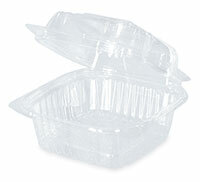 Strong and sturdy eco-friendly clamshell containers won’t absorb liquids. Clear PLA food containers are made from U.S. grown corn. PLA containers should not be used to store food over 110 degrees. Available in a single compartment or with multiple compartments to keep foods separate. Containers are designed to compost in a commercial facility in 45-60 days. Meets ASTM D6400 specifications.